Savannah, GA - Led by a pair of firsts from eventual high point rider Karen Sproul, the College of Charleston posted their highest score so far this season, 42 points, two more than reserve high point team Savannah College of Art and Design. 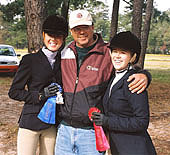 Other cougars to claim first place ribbons were Katherine Hickey (novice flat), Carrie Gatchel (advanced walk-trot-canter) and Liz Laroche (also advanced walk-trot-canter, seen in photo on left with head coach Bob Story and teammate Betsy Braisham, who placed second in the same section). All eight of the pointed Charleston riders placed fourth or higher. Sproul was first in intermediate flat and novice fences, leading to victory in a ride-off with the regions' high point open rider, Savannah College of Art and Design freshman Jordan Siegel. Today's competition was actually the second of back-to-back shows hosted by Savannah College of Art and Design. On Saturday, the University of Florida won a low-scoring affair with 31 points, six better than the host bees, with the cougars tieing Georgia Southern for third with 19. The scores were significantly higher on Sunday, with Florida third but still able to gather 28 points. Though the gator victory on Saturday and the cougar victory on Sunday left the bees without a win in the final shows to be held at their current equestrian center, Savannah College of Art and Design did well enough to overtake Florida for high point team overall headed into the winter break (Editor's Note: The Bees would again host shows at this same facility). The bees actually won one more class than the cougars on Sunday. Besides the open flat and open fences won by Siegal, Jessie Lambert (intermediate flat), Ashley Kelly (separate section of open flat), Nikki Makar and Natalie Cartner (both walk-trot) were also blue ribbon winners. Siegal ended the day with a 25 point lead over the gators' Amy Uniss in the region 3 open rider standings. Save perhaps in zone 1, region 4 (where Jessica Long of Boston University has not lost an open class yet this season), Siegals' 54-29 margin over Uniss is the largest lead nationwide in the hunter seat headed into the new calendar year! Gators still close: Savannah College of Art and Design will hold a narrow 148-146 lead over the University of Florida until the next hunter seat show in 2003. Charlestons' gains on Sunday put their total at 125, still within reach of the bees and gators. Other undergraduates to win classes were a pair of gators, Jamie Hack (who won the only section of intermediate fences) and Misty Hunter (who won the only section of beginner walk-trot-canter). Lauren Santonastaso of Emory University became the only rider not from the bees, cougars or gators to win an undergraduate class on Sunday when the eagle rider won her novice flat class. The unusual journey of Angela Verberkmoes Woolen: Though College of Charleston graduate Julie Ackerman and Georgia Southern graduate Jerri Thomas did not take part in alumni classes over the weekend, the other two "Regulars" did show, joined for the first time this season by Rensselaer Polytechnic Institute graduate Ler Gullayanon. Each of the two alumni classes had the same result: Gullayanon was third, Lindsay Abernathy (Wesleyan College '00) won and Angela Woolen was in between. Abernathy moved into the lead in both the flat and fences while Woolon moved up to second overall over alumni fences and third overall in alumni flat. Woolen, though actually still going to college, is riding alumni due to the IHSA's "Five year rule." Woolens' oddessy began when she was still Angela Verberkmoes. "I rode for two seasons at Wesleyan College (1995-97), then was off for two years. Then I went to University of Findlay for a year (she became Mrs. Woolen at that time). Rode there. Then took two more years off, had a child, and now I am a junior at Wesleyan!" IHSA rules only permit a rider to take a certain amount of time to class up, and with all the stopping and starting Woolen is not eligible to ride as an undergraduate. Woolen can claim to have ridden for Wesleyan College when Jon Conyers was still the coach (he later coached Savannah College of Art and Design and is now involved, somewhat ironically, with the Findlay program). Conyers was not yet at Findlay when Woolen was there. Barb Lindberg was the head coach at Findlay at that time (Lindberg now coaches Johnson & Wales University, who compete against a school in Connecticut named Wesleyan University, but that's about as ironic as that one gets). Needless to say, Woolen is truly committed to IHSA competition, regardless of the level. Hurricanes in attendence: The University of Miami Hurricanes made the long drive up from South Florida to compete. Competing in the IHSA for their fourth season, Miami has had trouble in the past getting to shows (the hurricanes are the only program in South Florida actively showing in the IHSA, thus driving almost six hours to get to their closest rivals' show, this when the University of Florida is hosting). It would be hoped that the University of Miami will provide better funding for the team in the future, perhaps to fly the team up to Charleston for the next show the cougars host. Their point card is nearly complete (still need an open rider and perhaps a walk-trot-canter rider), and with perhaps the nicest year-round weather of any school riding in the IHSA (not to mention the proximity of riding facilities in the Palm Beaches to the north), the program could be hugely successful if the adminstraition got behind it. Jessica Johns (novice fences) and Jessica Yeaton (walk-trot) earned the best ribbons for the hurricanes on Sunday, both placing third in their respective divisions. Sproul earns the final ribbon at this location: Karen Sproul, whose older sister Elise was a teammate for two seasons, won the ride-off, a two-way affair with Siegel. With that out of the way, the end of the line had come for the current Savannah College of Art and Design Equestrian Center. According to head coach Courtney Petersen (whose sister Kristen was a teamate for two seasons when both attended the Unversity of Florida), the new facility will be quite eye-popping. "It is 200 beautiful acres with a gorgeous 5 bedroom house. We will be using it as an A show facility as well" said last seasons' high point open rider, who at least temporarily leads her old team by a couple of points until next time. Show Incidentals: Sunny skies. Temperatures climbing from the 20's to the low 60's. Start time: 9:25AM. Finish: 2:40PM - no lunch break or coaches/captains meeting. Point cards posted in this region? No. Alumni classes held in this region? Yes. Judge: Ms. Kim Dorfman, Aiken, SC. Stewards: Johnson/University of Florida, Leslie/Wesleyan College and Ellis/Georgia Southern University. Team Totals: College of Charleston (High Point Team) 42; Savannah College of Art and Design (Reserve) 40; University of Florida 28; Emory University 19; Wesleyan College 11; Georgia Southern University 10; University of Miami (FL) 8; Georgia State University 8 and Florida State University 1.